I never realized the amount of wood putty in my joinery! At least in reference to some of my early projects. Apparently I must’ve bought the stuff in 5 gallon drums by the look of it. It really shouldn’t come as that much of a surprise. As a beginning woodworker we often make mistakes and turn to caulk or putty to help hide them. Eventually we learn to make our joinery tighter and move on to other more ornate ways to hide mistakes…like embellishments such as intricately detailed hardware or inlays. But still, this discovery of just how much wood putty there was in my joinery was a little unnerving. It happened recently while I was “DE-constructing” the bunk bed set I built for my kids when they were little and sharing a room in our old house. I’ve always been so proud of that project, and still am to be quite honest. 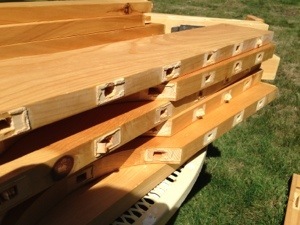 It was a lesson in mortise and tenon joinery given all the slats in the headboards and footboards. And an even bigger lesson eventually on learning about which hardware to use and not to use when assembling everything together. I apparently never put two and two together on the woeful inability of wood putty to add extra strength or holding power to my undercut joinery, even after the first time one of the headboards came loose because my tenon wasn’t quite thick enough. In hindsight apparently my inexperienced self (this was before I discovered there was any kind of information online for woodworkers) rationalized a little wood putty would fill that gap nicely and setup like cement for years to come. Thankfully the kids survived, and we’re now preparing to build new and larger beds for them. Ones that will be reinforced by the strength of the joinery itself…but probably covered in some sort of intricately detailed hardware or inlay.